We were getting closer to the coast, but we couldn’t see anything. It was already dark. We haven’t planned to drive in the darkness, but our car broke down, and that caused long hours of delay. We booked our accommodation at the national park’s campground. 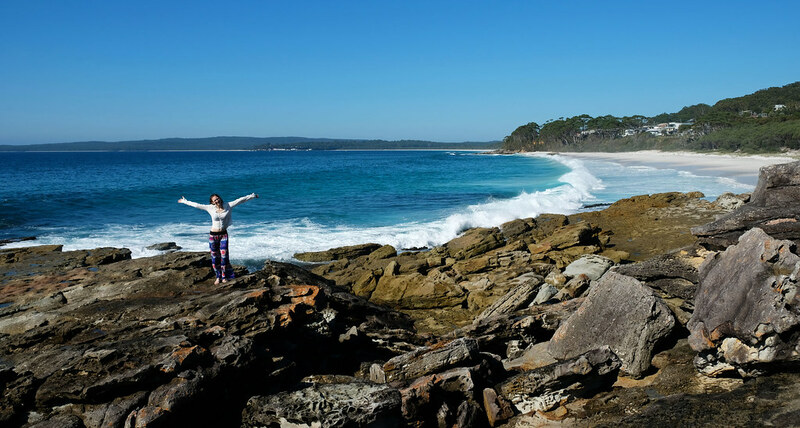 A narrow road lined by trees and bushes led to Booderee National Park, located on the peninsula south of Jervis Bay. In New South Wales, Australia. That faraway land down under. The creatures of the night appeared out of the deep darkness unexpectedly. But they disappeared just as fast while we only caught a glimpse of them by the headlights of our car. Kangaroos. We could only see the shapes of their dark bodies, and their sparkling eyes. Wombats. They reminded us of clumsy little bearcubs. We arrived to the campground around 11 pm. Everything was silent. We drove around a couple of times on the dirt tracks inside the campground until we found our spot. We headed for the amenity blocks when we noticed a pair of huge eyes on a nearby tree. I directed my flashlight there: it was a possum, sitting on a lower branch of the tree, eating peacefully. A day before I felt desperate – being in a faraway country in a broken down car, without a working phone. However stressful that previous 24 hours were, I felt a calming magic in this warm, dark Australian night full of strange and cute creatures. I woke up to find myself in a lovely forest. A bright Australian coastal forest. A curious little wallaby was staring at me as I got out of our campervan, still half asleep. 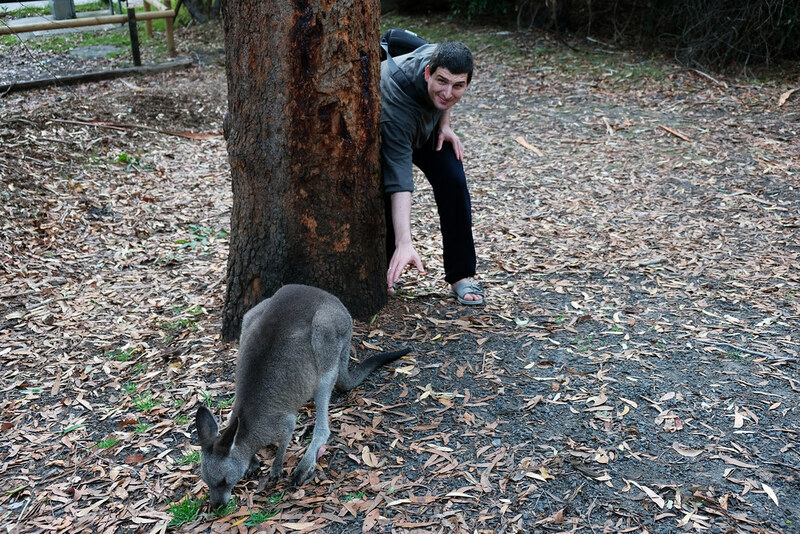 I literally almost fell over two kangaroos as I headed to the water block to wash my face. I ran back to our car to wake Csaba up. We haven’t seen kangaroos from such a close distance in the wild yet. We soon headed to the beach for a morning picnic. Barefoot. 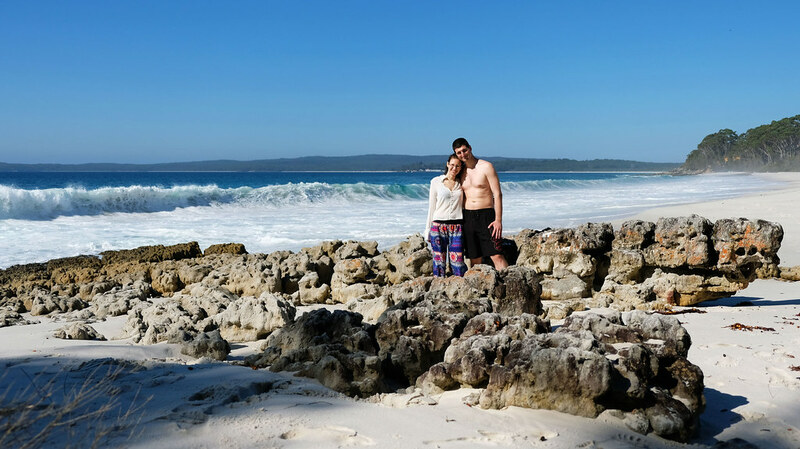 Sitting on a large log, we were gazing at the bright blue sky and the turquoise water. 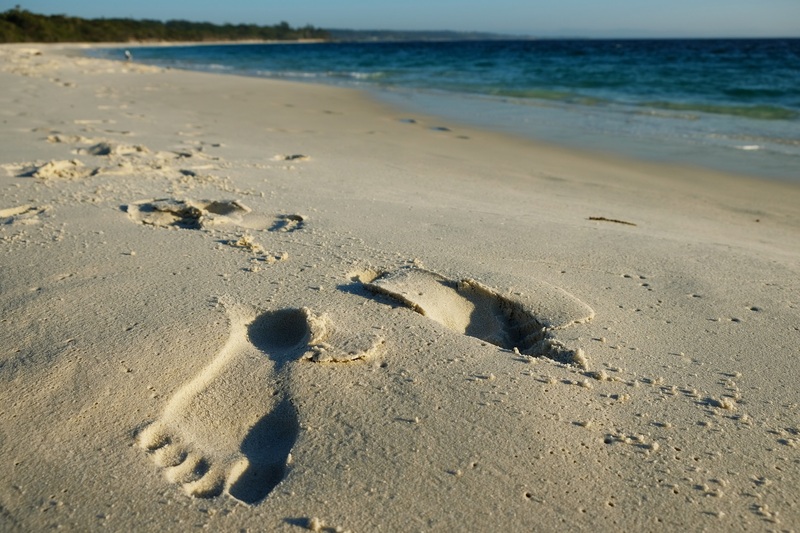 And we felt that soft, fine sand under our feet. 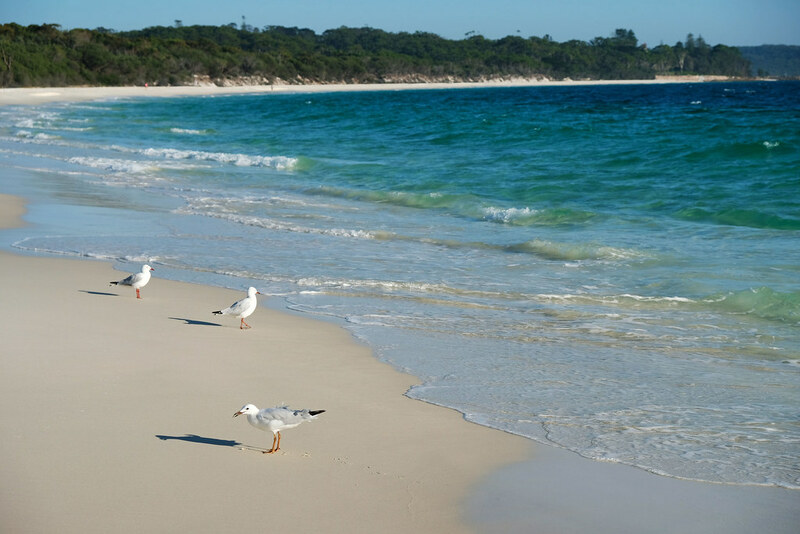 That pure-white sand that Jervis Bay is so famous for. We’ve never seen anything like that before. We had a walk on the beach. There were barely anyone there. 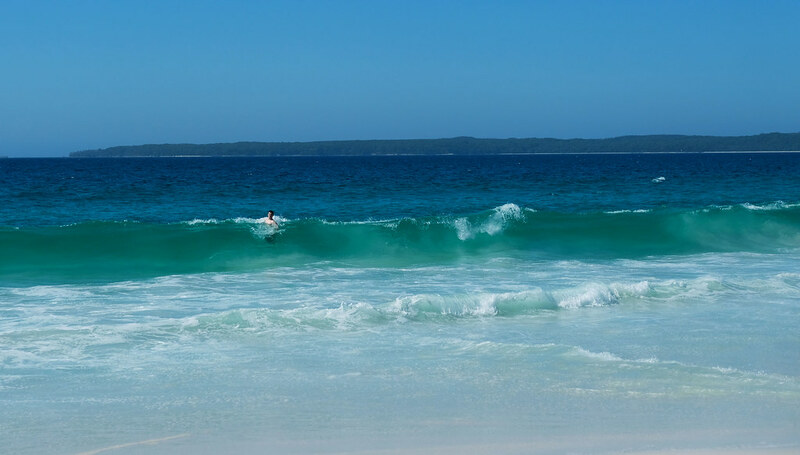 If something is even more fascinating than the unspoilt beauty of the Australian beaches, it’s the number of people we’ve seen on those magical beaches. It usually varied from 0 to 20. It constantly reminded us that we were at the end of the world. And we were quite happy to be there. Feeling the sun on my skin, the light breeze on my face, and the sand under my feet, I felt so happy and satisfied that I haven’t felt a long-long time ago. It was one of those rare moments when I felt I had everything I need. And so I did. I put my hands into his, and we ran into the waves, laughing. 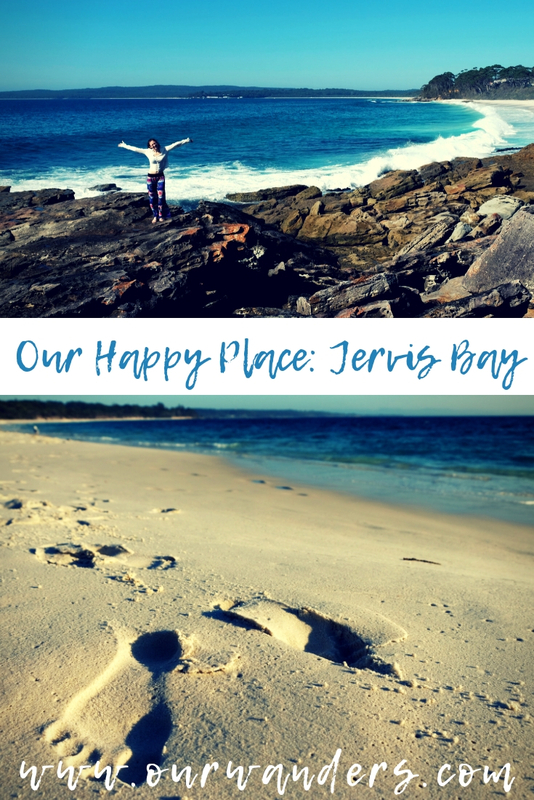 Do you have a happy place anywhere in the world? Previous post Let’s Take A Walk In The Koala Forest!